The little things from last week’s checklist are done. This week is all about the start menu and the screen shot is the section with the most content: the demon select screen. The screens are pretty much finished, it’s nothing flashy but gets the job done I think. 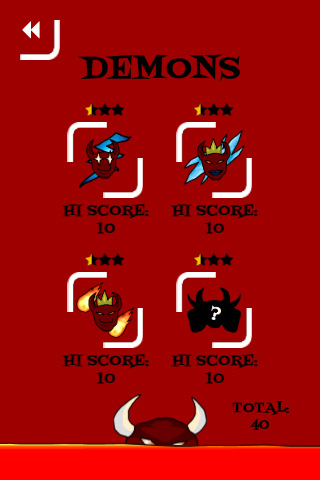 I still have to link the high scores to reflect the player’s actual scores but I might do that later. What’s next: might be a good time to start thinking about the tutorial levels and how to teach players how to play. I could also start putting in sound and music, and of course setting up the high scores.